Introduction: Synthetic Quartz that is used in microelectronics is produced in an autoclave via the hydrothermal process. 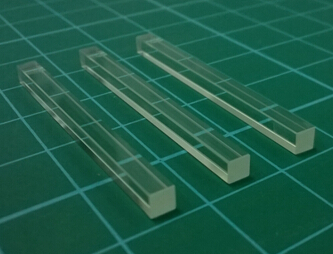 Our Synthetic Quartz is then polished into transparent quartz glass substrates with an ultra-high purity and improved optical transmission in the deep ultraviolet. for LCDs and fiber optics, substrates for high frequency (RF) applications, microfluidic substrates, Nano-Imprint Templates, and DNA chip substrates. S-Grade Synthetic Quartz Glass Substrates feature Ra<2A surface quality (Double Side Typ.) per semiconductor standard. Purity: High purity levels eliminates contamination in the quartz substrates. Chemical resistance: Excellent thermal shock resistance and quartz glass is chemically inert to most elements and compounds including virtually all acids. Heat resistance: High dimensional stability of the quartz glass over a wide temperature range with extremely low coefficient of thermal expansion. Transparency: Quartz glass allow a high transmission over a wide range of wavelengths from UV to IR. Fluorescence: No fluorescence over a wide range of wavelengths from UV to IR. Dielectric properties: Low dielectric loss even at GHz frequencies. Surface: High flatness, high uniformity of thickness and smooth surfaces, attributed to the techniques developed for quartz glass photomask substrates used in LSI manufacturing. A-Grade Quartz substrates, Quartz plates, slides, wafers and Quartz windows are widely used for imaging / coating purpose. B-Grade Quartz substrates, Quartz plates, slides, wafers and Quartz windows are used for imaging / coating purpose and material processing. C-Grade Quartz substrates, Quartz plates, slides, wafers and Quartz windows are widely used in material processing.